The Ducks scored again Tuesday night when a report resurfaced from Juco Football Frenzy on Twitter. OLB Jonah Moi has committed to the University of Oregon instead of the Washington State Cougars! Moi was committed to WSU, but after his visit to Eugene, Moi was impressed enough to commit to Oregon instead. 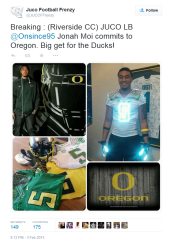 This 3-star recruit will make the jump from Riverside CC Football to Oregon Duck football. Moi is 6’4 and weighs 235 lbs. 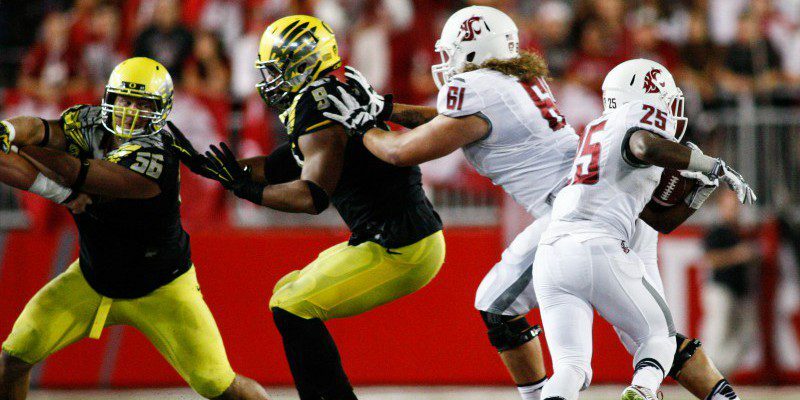 The Ducks needed another inside linebacker and he should fit in their scheme perfectly. Earlier today PJ Locke flipped from his commitment to Oregon and went with the Texas Longhorns instead. So much for spreading his wings at Oregon, but best of luck to Locke in Texas. Moi brings more depth to an already strong list of commits that includes Kirk Merritt, Malik Lovette and Travis Waller. Acording to 247sports.com Oregon has commitments also from Jihree Stewart (CB, Corona, CA), Fotu Leiato (OLB, Stelacoom, WA), Calvin Throckmorton (OT, Bellevue, WA), Jake Breeland (TE, Mission Viejo, CA), Jake Hanson (QB, Eureka, CA), Gary Baker (DT, Upland, CA), Shane Lemieux (OG, Yamika, WA), Drayton Carlberg (OT, Minneapolis, MN), Gus Cumberlander (DE, Decatur, GA). Oregon has done a very nice job of recruiting and will definitely benefit from this recruiting class for years to come.